Located on the 14th floor of the Sheraton on the Falls, the Christienne Fallsview Spa offers a tranquil and revitalizing spa experience with spectacular views of Niagara Falls. With an amazing Relaxation Lounge, Canada’s only Hydrotherapy Infinity Tub, and a number of incredible services and treatments like the Guac n’ Glow Toning and Tightening Facial, Hot Stone Massage and Mineral Fusion Wrap, it’s the perfect place to visit when you’re looking to unwind and be pampered. This private space on the hotel’s Upper Lobby provides a comfortable place to relax and enjoy complimentary continental breakfast as well as coffee, tea, and snacks throughout the day. The Sheraton Club Lounge also provides sweeping views of the beautiful Oaks Garden Theatre and thundering Niagara Falls, so make sure to upgrade your reservation to gain exclusive access and experience it all. The Sheraton Fitness Centre has everything you need to stay active and fit while away from home. This newly upgraded facility offers a fitness studio with state-of-the-art strength training and cardio equipment so that you can keep up with your daily exercise routine while visiting Niagara. The Sheraton on the Falls hotel features not one, but two spectacular Fallsview swimming pools available for use during your hotel stay. 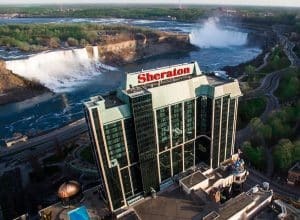 The Sheraton’s indoor Fallsview pool is open year-round while the outdoor Fallsview pool and patio on the roof of the hotel’s conference centre is a spectacular seasonal spot that offers unparalleled views of Niagara. Sit back with your laptop, relax with a nightcap, catch a game, or gather with your group in the Sheraton on the Falls’s Lobby Lounge. It’s conveniently situated next to the hotel’s interior shopping concourse and is a comfortable meeting space to share and enjoy with friends and colleagues. The Sheraton on the Falls hotel offers these amazing amenities and more in order to make your Niagara Falls getaway as relaxing and enjoyable as possible. With a location just steps away from the thundering Falls and incredible Fallsview guestrooms featuring floor-to-ceiling windows, it’s a hotel experience that is truly unlike any other.